In the last blog, we discussed the first five of ten perennial plants to refresh the yard with colour. Of course, many of the hardy perennial plants can help when the landscape may include slopes or even somewhat difficult growing conditions which require hardier plants. Many of the flowering perennials are easy to grow and maintain, allowing us to balance the time we spend with our family in a variety of activities throughout the summer months and the time we’d like to spend in the garden. With a little up front organizing and planning, garden tool storage as well as composting bin storage can be worked into the garage. The slatwall organization system of storage offers options for tools, lawn mowers and supplies for the gardener who needs easy access to both the front and back yard gardens and who wants to avoid taking up valuable landscape with a garden shed. A garage renovation makes it possible to offer convenient access to gardening tools and supplies. Of course, one of the most important steps in gardening is planning or choosing perennials based on the garden’s access to sun and the qualities of the soil. Here are the last five of the ten perennial flower choices that we would like to review. The sunny and sweet Shasta daisy is a classic perennial. The blooms on these daisies are larger and more robust than the wild roadside daisies. These flowers have white petals and deep yellow florets and they will blossom every year in late spring or early summer until early fall. They are 2 to 3 feet tall and grow in clumps which are 1 to 2 feet in width. They love full sun and good soil with proper drainage so use your compost to enrich the garden bed for these flowers every year. And, after the first killing frost of the fall, cut back the stems to 1 to 2 inches for best results in the following season. These star shaped flowers grow in clusters creating great ground cover. The creeping phlox in particular enjoys shade and would work well around and under shrubs as ground cover. They are easy to grow and maintain like many of the perennials. It’s easiest to grow phlox from a cutting than from a seed. Plant them in spring in moist compost rich soil. Different phlox want a variety of conditions. Border phlox like Carolina phlox, Meadow phlox, and Garden phlox want moist, well-drained soil as well as full to partial sun. Low, mounding phlox like Sand phlox and Chattahoochee don’t mind average to sandy soil which is well-drained with full sun. Woodland species like Blue phlox and Creeping phlox need moist, humus-rich or in other words, mature nutrient rich compost with full to partial sun. The purple coneflower is Echinacea and it is as sturdy as it is beautiful. The flowers have purple leaves and a cone at the centre where the seeds of the flower are found. The seeds in the cone attract both birds and butterflies to the garden. The flowers bloom in mid-summer and they are so hardy that they fare well in heat while being rather drought resistant. They also repel deer so if you’ve got a vegetable garden nearby, it’s a handy flower to have around to keep your garden free of wildlife wandering through the vegetables and munching their way through a season of your hard work. There are a variety of purple coneflower colours. The Robert Bloom has dark orange centers with bright crimson flower petals. The Tennessee coneflower has greenish-pink centers with dark mauve flower petals. The Finale White has creamy white flower heads with greenish-brown centers. The bleeding heart flower appears in early spring as heart shaped pink and white flowers or just white flowers all strung along the arched stem of the plant. The foliage is a beautiful bluish green. The bleeding heart needs a cool shady spot in the garden with moist nutrient rich compost soil which drains well. They do well being planted in the spring or fall. The heat of summer will cause the bleeding heart to wither away but there’s no need to cut away the dying foliage as the plant is taking this time to store away food reserves for the following year’s new growth of the flowers. Over time, the clump of bleeding heart flowers can become overwhelming and they can be separated with part of the clump planted elsewhere in the garden. The bleeding heart plant grows from 1.5 to 4 feet tall. The cranesbill or hardy geranium is beautiful and easy to grow perennial with violet-blue petals typically. They are resistant to pests and disease and do well in a variety areas in a garden. The growing conditions include soil which is moist, well-drained and nutrient rich so top up your garden with compost each spring to keep the ground well suited to these plants. Some do well in full sun areas and they also do well in partial sun conditions as well. And, the gardener’s reward is a perennial which produces a long bloom from spring until late fall. These flowers come in a variety of colours including purple, blue, white, and pink. The flowers have 5 petals which are from ½ to 1½ inch wide with the typical colour being violet-blue petals of a Rozanne variety. The geranium is often confused with the flowers called pelargoniums at the local garden centres. The pelargoniums are a ball shaped bundle of flowers and the garden centres often market these as geraniums. However, the pelargoniums are annuals and are not the hardy geraniums which are perennials. If you feel unprepared to store the variety of supplies and tools for your garden, consider a garage renovation to maximize your landscaping space while organizing your garage and yard space. Then, you can enjoy looking after an easy to maintain perennial garden. A complimentary in-home consultation with one of our garage renovation specialists can help you. Whether you need to care for perennials or you have other lifestyle activities which may end up using storage space in the garage, call on Nuvo Garage to help you plan and design the garage space. Decorating your home in celebration of the holiday season may be something you look forward to each year. However, if you’ve ever spent hours searching through battered cardboard boxes for a favourite holiday ornament, you know what a dreaded chore the annual holiday decoration hunt can be. Getting your home ready for the holidays is a big enough job. Tracking down strings of lights and other seasonal decorations depletes you before the real even job begins. However, implementing four changes to how you store your holiday decorations will make storing and retrieving seasonal items a snap. The size, shape and fragility of seasonal items make them challenging to store. Large artificial trees can be unwieldy. Wrapping paper and ornaments can easily be damaged. Strings of holidays lights easily become tangled, damaging bulbs or wiring, which creates a fire hazard. However, just as selecting the right tool makes household repairs quicker and simpler, so does choosing the right storage container for each seasonal item. Specialized seasonal storage containers are available for the most common seasonal decorations. Storage bags—many with a rolling base—are the perfect way to store a large, artificial tree. Multi-level, compartmented storage totes provide safe storage for fragile tree ornaments. Specialized storage spools keep holiday lights tangle free and complementary storage bags prevent damage to bulbs or wiring. Holiday wrapping paper organizers keep wrapping paper clean and dry while preventing rips. Relatively inexpensive specialized storage containers make storing and retrieving artificial trees, holiday lights, ornaments and wrapping paper simpler. However, what is the best way to store holiday décor odds and ends for which specialized containers are not available? Clear storage boxes make seasonal items easier to find. Any big box store has a variety of plastic storage bins in stock. Available in a wide range of sizes and colors, plastic storage bins can accommodate an endless array of seasonal decorations. Solid colors can be festive. However, transparent storage totes are more functional. The contents stored inside can be quickly and easily identified. Still, items in the center of the tote may be difficult to see. One more step makes keeping track of all of your seasonal items a breeze. At the end of the holiday season, seasonal decorations are frequently tossed in random cardboard boxes and shoved in a corner. This storage method takes the least amount of time or effort. However, it necessitates far more time and effort when the next holiday arrives and causes needless frustration. A little forethought while storing seasonal items will make life much easier next holiday season. Labeling each plastic bin and specialized storage container with its contents may seem tedious. However, it must only be done once. At the end of the season, return items to the appropriate storage bins. The time invested in neatly labeling storage bins will save time and prevent frustration for years to come. Plastic storage totes and specialized storage containers make storing holiday decorations and other seasonal items a breeze. However, large storage bins can take up a lot of space in your home or garage. 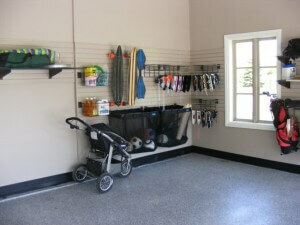 Creative storage solutions can multiply garage storage space without sacrificing valuable floor space. Floor space is at a premium in your garage. Only so much can be stored along the garage perimeter before parking your vehicle inside becomes precarious, if not impossible. However, creative storage solutions can significantly increase the storage capacity in your garage. Overhead shelving converts unused space into usable storage space that won’t interfere with vehicle parking. Standard overhead garage shelving options require a step ladder to access the space, making overhead storage ideal for storing seasonal or seldom used items. A range of overhead shelving options are available, but always consider safety first. Overhead garage shelving should be installed by a qualified expert or someone knowledgeable about the safe installation of weight-bearing overhead shelves. Strong racks steel shelving, for instance, is made of tough, 11-gauge steel and can safely hold up to 750 pounds when installed properly. An experienced garage renovation expert can install pre-fabricated shelving or build made-to-measure wood shelving designed specifically for your unique space and individual needs. A garage renovation expert can also install hydraulic lift shelving that can be raised and lowered with the push of a button, eliminating the need to scale a step ladder with bulky items. Storing and retrieving seasonal decoration doesn’t have to be a dreaded chore. Use specialized storage containers and clear plastic totes to store holiday lights and seasonal decorations. Label containers to make it easy to identify contents. Then request a consultation to discover how overhead garage shelving can expand garage storage and make storing seasonal items a snap. Are Your Prepared for Disaster? No one likes to consider the possibility of a disaster, be it natural or manmade. However, the reality is that such disasters do occur. In the event of a catastrophe, it could take first responders up to 72 hours to reach you. Would you be prepared to fend for yourself for at least that long? Disaster preparedness can vastly improve the outcome for you and your family if the unthinkable were to occur. Let’s review a few simple steps recommended by Public Safety Canada to prepare you to hold out until assistance arrives. Whether you live in Ontario or elsewhere in Canada, there are certain risks inherent to your area, particularly at certain times of the year. Tornados, blizzards, flooding, severe storms and power outages are among the various risks for which you may need to prepare. Understanding which risks are most probable for your community will help you prepare for the likeliest disaster and be more prepared for any calamity. Visit GetPrepared.ca to review a full list of disasters. Get the statistics on each type of disaster and find out which regions are most likely to be affected by it. Learn what to do before, during and after, in the event that particular disaster strikes your community. How would you escape your bedroom if fire barred you from opening the door? If you’re on a higher floor, how would you safely exit the window? If you’re separated from your children, would they know what to do? Perhaps you’ve given thought to these questions. That’s an excellent first step. However, it’s important to clearly communicate an emergency evacuation plan to every member of your family. Even small children should know what to do in the event of a fire. When an emergency happens, we don’t always think clearly. Having your plan outlined in writing and accessible to every member of the family can be invaluable during times of distress. Keep printed and digital copies of your emergency plan in various locations, including a central location everyone knows. Your plan of action should outline rendezvous points outside your home in case of an event like a fire. A rendezvous point outside of your community is also essential to prepare for an incident which forces you to evacuate the neighbourhood. Practice the plan with young children so they commit it to memory. This will help them to calmly execute the plan, in case they get separated from you. Whether a disaster forces you to hunker down in your home or garage for several days or forces you to evacuate your home and community, you’ll need to have a stash of supplies on hand. Store three days’ worth of non-perishable food items like canned or dried goods. 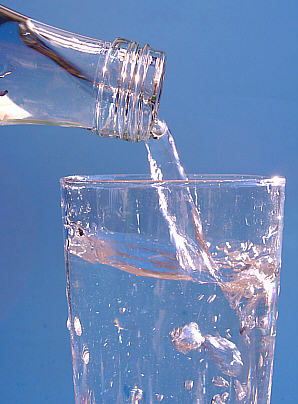 Include at least two litres of water per family member during that three-day period. Large water jugs are an easy way to ensure there is enough water for everyone—including pets—if you are stuck in your home. However, if you must leave your home, smaller bottles are easier to transport. In addition to food and water, be sure to keep an emergency supply of medications. Your emergency kit should be a portable grab and go bag. If you have a large family, it would be difficult to store enough supplies for everyone in a single, easily portable duffle bag. Instead, create a separate backpack for each family member that is tailored to their specific needs and that each member can easily transport. 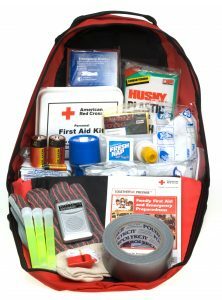 A variety of additional items should be in the emergency kit, including a small amount of cash, a battery-operated flashlight and radio, a manual can opener and first aid supplies. Though not every creature comfort will fit in your grab and go bag, a variety of other items like toiletries should be stocked near your emergency kits. Garage shelving or garage cabinets are a great place to store your kits and additional emergency supplies. For more info on how to prepare your family for a natural disaster, visit GetPrepared.ca. To learn more about how to maximize the storage capacity of your garage to better accommodate a stash of emergency supplies, visit NuvoGarage.com. If garage organization is one of your goals this year, keep two essential principles in mind. Adequate space is required, and each item should have a designated storage space. Taming the clutter in your garage might seem like a monumental task. However, integrating simple elements like baskets, hooks and shelves can increase the available storage space exponentially, providing a designated spot for each item. Whether you choose to do a full-scale garage renovation or a mini, do-it-yourself one, these tips will transform your garage into an organized storage space. A garage consists of three walls and a floor, providing very little storage. With no defined organization system, items are stacked on the garage floor. Eventually, these items take over one of the garage bays. In many cases, the entire garage is consumed as garage becomes a dumping ground for old furniture, broken toys and a host of unused items. The first order of business is to eliminate the unnecessary. If possible, start by removing everything from your garage. This serves two purposes. First, you can see everything you have stored there. Second, you have a clean slate to work with. Group similar items, like gardening tools, hardware and sporting goods. Now you can easily identify duplicate items. Sort through everything. 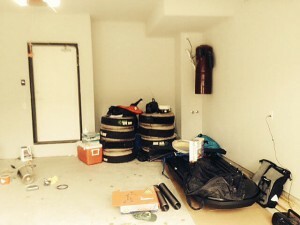 Assess whether each item is needed and if the garage is the ideal place to store it. Create piles for items that will be discarded or relocated. Donate old furniture, appliances and clothing and housewares to local charities or to a friend. Once you are left with only the essential items to be stored, decide where each group of similar items would best be stored in your garage. Now it’s time to use vertical space to create task-related zones for each group. Vehicles consume most of the limited floor space. Few garages are designed to tap into the wealth of vertical space. Maximize storage space storing items on the walls and overhead. Shelving units from local box stores can provide additional storage space. However, these units tend to take up considerable floor space. This is problematic for storage on side walls, where space is already limited. A sleeker option is a wall organization system. Slotted wall panels are attractive, waterproof and mold and mildew-resistant. Available in a variety of colours, the 1 x 8 foot panels are super strong, engineered to meet heavy-duty industry standards. They are attached to wall studs for additional strength. Slatwall panels are sturdy enough to hang bicycles and other heavy items. Hang one or two panels or an entire wall of them to create the base for your vertical organization system. Then use the vast array of corresponding accessories to maximize storage. The real beauty of slatwall lies in the countless corresponding accessories designed to meet a wide range of storage needs. Wall organization system accessories include baskets, bins, nets, hooks and shelving. These receptacles provide a tidy place to store items like gardening supplies, household chemicals, hardware and more. Is sports equipment littering your garage? Sport-specific specialty hooks and racks are perfect for avid sporting enthusiasts. Magnetic strips and specialty racks can corral an assortment of tools. Wall organization systems are highly-configurable. The corresponding accessories are quickly and easily interchangeable. This creates a system flexible enough to meet your family’s changing storage needs from one season to the next and throughout the years. Storing items in baskets and on hooks and shelves is ideal for frequently used items. To find the best place to store lightweight, seasonal items, just look up. Overhead shelves and platforms convert wasted space into a convenient place to store stackable plastic bins. Overhead storage racks should be installed by a garage renovation expert, or someone who understands how to safely install loadbearing overhead shelves. Prefabricated steel shelving, like Strong Racks, provides strong, sturdy overhead storage that is easily accessible with a step ladder. For something tailored to your unique space, hire a garage renovation expert to build a made-to-measure overhead storage shelf that will allow you to maximize the space configuration in your garage. An overhead shelf can provide additional storage near the back of the garage or above the garage door. Do you have a high ceiling in your garage? 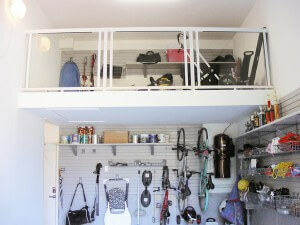 Turn the wasted space into a storage treasure trove with a custom built mezzanine. Like the idea of overhead storage, but don’t relish the thought of trudging up and down a step ladder with bulky holiday decorations? Hydraulic overhead lifts provide push-button access to overhead storage. Hydraulics lifts come in a wide range of options. They provide raised storage for everything from seasonal items to lawn mowers, bicycles, motorcycles and cars. Whether you’re ready for some do-it-yourself garage organization or a full-scale professional garage renovation, a local garage renovation expert can help you use baskets, hook and shelves to transform your garage into a neat, organized space. When you live in a region known for long, cold winters, you can either hide out inside until the snow melts or learn to love all that the great outdoors has to offer during winter in Toronto. Whether you’re the adventurous type or prefer to be a spectator to the winter fun, Toronto has something to offer. Perhaps you dread winter sports because kids and pets track snow, salt and grime onto floors and carpeting. Avoid the mess in the house by making your garage the launch pad for all winter activities. Maximize winter fun by first making sure everyone stays safe. 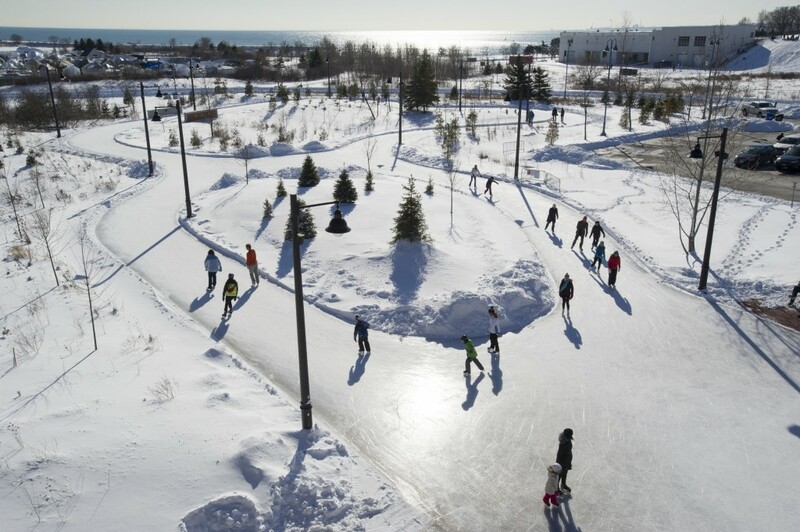 Skaters at Colonel Sam Smith Park Ice Trail. While there are lots of fun things to do in the Greater Toronto Area during winter, it’s important to put safety first. That means wearing proper gear like helmets, mouth guards, and knee and elbow pads during sports like hockey or snowboarding. However, keeping yourself and others safe during snowy, icy winter weather begins by making sure the driveway and sidewalks outside of your home and garage are properly maintained. Per Toronto Municipal Code 719-2, property owners have twelve hours after the snowfall, rain or hail ends to remove snow and ice from sidewalks surrounding their property. If the removal of snow or ice leaves the surface slippery, the property owner must put down sand, salt or ashes to cover the surface. Failing to comply with this code could lead to fines or slip-and-fall lawsuits, so stay vigilant about preventing ice and snow from building on sidewalks, driveways and around your garage. Create a zone in your garage where winter weather supplies and equipment are kept. The snow blower will likely fit best along a back wall, so it won’t interfere with parking your vehicles in the garage. However, shovels, salt and ashes should be stored near the garage door for convenient access. 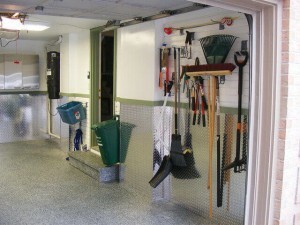 A slatwall organization system, like slatwall, with its corresponding shelves, hooks and baskets, is ideal for storing winter weather items near the garage door. Garage storage cabinets offer another excellent option for storage. A good wall organization system will allow you to easily configure hooks, baskets and shelves to accommodate your storage needs during the changing seasons. Hockey sticks, pucks, ice skates and other winter sports equipment can be accommodated during winter. Larger items, like skis, snowboards, sleds and toboggans can be stored using specialty hooks and shelves or on larger, made-to-measure shelving or platforms. 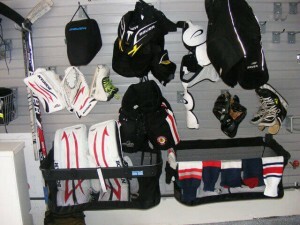 When spring arrives, the wall organization system can be reconfigured to store summer sporting goods. Ice skating: Enjoy free ice skating at Harbourfront Centre’s scenic Natrel Rink, set on the shoreline of Lake Ontario. Skating is free and rental skates and helmets are available. New to ice skating? Child and adult skating lessons are available. Turn the fun up a notch with another free event, DJ Skate Nights on Saturday nights through February 20th. Tobogganing: Ready to head down the slopes? Grab your sled (makeshift or store-bought) and head for one of the various toboggan hills located in neighbourhoods all over the Greater Toronto Area. See the downtown skyline from Riverdale Park East or check out Christie Pits Park where the hills come in different sizes to accommodate daredevils and more reserved sled enthusiasts. Snowshoeing on Toronto Islands: Who says the beach is only a summertime destination? Enjoy the peace and quiet of the Toronto Islands without the busy summer crowds. Snowshoe or cross-country ski, then build a snowman with the kids. Icefest on February 21 – 22: Head over to Bloor-Yorkville for the 2016 Icefest. This year’s theme is Frozen in Time. See magnificent ice sculptures inspired by Ancient Egypt and check out live ice carving competitions. Bonus: Winterlicious on January 29 – Feb 11, 2016: This isn’t an outdoor event, but after all that ice skating and tobogganing, you’ll work up an appetite. Winterlicious offers a great opportunity to sample some of Toronto’s finest cuisine without breaking the bank. Try prix fixe, 3-course meals at more than 200 restaurants all over the city or take a cooking class during this yummy winter event. Regardless of which Toronto outdoor winter activity you and your family enjoy, your garage can serve as the perfect launch and landing pad for your adventures. 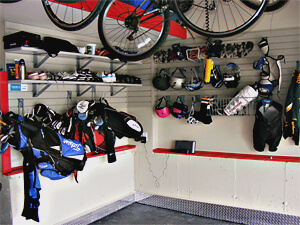 An organized garage with a wall organization system, cabinets or bins for specific sports or individual family members makes it easy to store and retrieve everyone’s gear. When you return home, you can clean toys, skis and sleds so they’ll be ready for the next adventure. If your garage can’t accommodate all of your winter adventures, discover how a few renovations can make winter safe for you and your neighbours while making it easy to enjoy all the fun of the season. With a little help from Nuvo Garage, planning and renovation during the spring and summer months can improve the layout and function of even the smallest of garages. It’s a New Year, but if you’re still dealing with the same old problems with your garage, you’re probably wishing you’d tackled a few of those garage renovation projects last year. Before this year flies by as quickly as the last, here are five reasons to get a jumpstart on those projects now. You have a shiny, new vehicle with all the toys. Unfortunately, there’s no room for your car or truck in the garage. The limited space in your garage is overrun with bicycles, sporting goods, broken furniture, lawn equipment, gardening tools and seasonal items. Every morning you get up half an hour earlier and trudge out in the frigid temperatures to clean ice and snow off your vehicle. If you don’t, you’re forced to choose between rushing to work in dangerous winter driving conditions and arriving late to work. Solution: You know it’s time to clean up your garage’s act, but you’re not quite sure where to begin. Consider making the big garage cleanup a fun family project. Store items neatly around the perimeter of the garage. Install a slatwall organization system with corresponding hooks, shelves and baskets to maximize vertical storage space. By freeing up floor space, you can park inside the garage and pamper your new vehicle or extend the life of an older one. Your family has dubbed your garage the Bermuda Triangle because anything you store there seems to disappear. Finding your golf clubs and tennis rackets or the children’s hockey sticks and softball equipment is a chore. You own duplicate ratchet sets and gardening tools because it was easier to buy new ones than spend an entire afternoon hunting down the old ones. Solution: Remove everything from your garage and create dedicated task zones. Group automotive supplies, garden supplies, tools and other similar items. Maximize storage in each zone with the corresponding baskets, hooks and shelves of a good wall organization system. Toss broken items and sell or giveaway duplicates. Everything will be easier to find, so you’ll spend less time on garage scavenger hunts during frosty winter weather. Not everyone wants their items on display. You might prefer the clean, sleek look of hidden storage. Or perhaps you need to keep toxic household and automotive chemicals out of the reach of curious hands and paws. Solution: Modular or custom garage cabinets provide safe, lockable storage space fitted perfectly to the length of the wall of the garage. Want to keep your items out of sight? Garage cabinets provide hidden storage. They can even be configured to hide plumbing or a central vacuum cleaner. Perhaps you only need to secure a few items, like valuable automotive tools or toxic household cleaners and antifreeze. A combination of open and closed garage storage is a perfect solution. Your approach to the holidays is go big or go home. But the other eleven months of the year you find yourself sharing space in the garage with Old St. Nick, Rudolph and a 20-foot tall inflatable snow man. Then there’s the seasonal sports equipment—kayaks, pool floats and winter sleds—to contend with, leaving little or no room for your vehicles. Solution: Overhead storage racks transform dead space into viable storage for seasonal and oversized items. Strong metal storage racks or sturdy, made-to-measure wooden shelves take advantage of ceiling height and create additional space for items seldom used, like holiday decorations and seasonal sporting goods. Most overhead storage racks can be easily accessed with a step ladder. However, for ultimate accessibility, motorized overhead storage provides push-button access. Grease, oil, rust and a host of mystery stains mar the look of your garage floor. Even when it’s clean, it doesn’t quite look it. If your garage is older, there may be some chipping and cracking that occurred during settling of the concrete floor. You’ve scrubbed the floor repeatedly with minimal results. Solution: Polyaspartic flooring improves the look of your garage floor. Applied in a single day, this flooring system is vastly superior to paint and comes with a 10-year warranty. Polyaspartic flooring is textured. It has a multidimensional look similar to granite and is available in a host of attractive colors, like Chocolate, Mountain Road, Moonlight and Sandy Beach. The texture provides added grip, reducing the hazard of slipping during rainy and snowy weather. If parking in your garage or finding essential tools has become a struggle or you don’t like the look or layout of your garage, there are a number of garage renovation solutions. Slatwall, cabinets or overhead platforms can deliver the form and function you want in your garage. Don’t get caught in the same position next year. Pull out your to-do list and contact a garage renovation specialist by early spring to plan your garage renovation project. Whether this winter is mild or as snowy and cold as our past two winters, we’re bound to get walloped by a few snow storms. Ontarians are no strangers to cold, blustery winters. While these conditions are routine, they aren’t innocuous. Winter storms have the potential to be deadly. Last time we discussed how to prepare your vehicle and garage for the winter. Now let’s review the supplies every garage should have stocked in case of a severe weather event. Stocking your garage with emergency supplies may seem overly cautious. However, Canadians fall victim to weather events, directly or indirectly, every year. Advanced preparation will increase your odds of staying safe during treacherous winter weather events. Power and communication lines are susceptible to outage during ice storms or heavy snowfall. In most instances, power is restored within a few hours. In more serious cases, you may be forced to go without power or communication for days. If the temperature dips dangerously low, how will you stay warm for several days? Would you have enough food and clean water on hand until services are restored? By taking action now, you’ll be ready to weather the storm. The key to surviving severe weather events is preparation. So be ready to act when dangerous weather is headed your way. Sign up to have weather alerts sent to your mobile phone. Be among the first to learn of impending bad weather so you can take action quickly. Create an emergency preparedness action plan. When an emergency strikes, it’s natural to panic. Develop an emergency action plan while you are calm and clearheaded. Review the plan with your entire family. Everyone should know what to do if a weather-related disaster strikes. Build an emergency survival kit. Gather the items you’ll need if a disaster strikes. Store them in your garage or somewhere accessible to everyone in your home. The items above can be packed in a backpack, duffle bag or portable container, in case you need to evacuate your home. The emergency kit can be stored on a garage shelf or platform or in a garage cabinet. When organizing or renovating your garage, include a space to store disaster supplies. Hopefully, you’ll never need to use your emergency supplies. To ensure all of the items are good when an emergency does occur, check the kit periodically. Rotate food, water and batteries, as needed, so they are fresh and ready to go when you need them. Always heed warnings broadcast on television and radio by the Alert Ready Emergency Alert System. Such warnings are issued by emergency management officials and Environment Canada to help you take immediate action to protect your family when severe weather strikes. In the event that ice or snow knocks out heating, it may be tempting to burn fuel inside of your home or garage. Don’t! It’s extremely dangerous and can lead to carbon monoxide poisoning and death. It’s fine to store your grill or propane tank in the garage, but move them outdoors when you’re ready to cook. Regardless of what this winter has in store, be prepared if you encounter severe weather. Sign up for text message weather alerts. Create an emergency preparedness plan and review it with every member of the family. Prepare an emergency survival kit and store it in your garage or someplace accessible to everyone. For more resources on building your survival kit, see the Ontario Ministry of Safety and Correctional Services. The Farmer’s Almanac predicts a cold and snowy winter here in Toronto. Yet, meteorologists are expecting a mild winter in Southern Canada courtesy of the worst El Niño we’ve seen in half a century. Either way, the first snow of the season has already hit. Perhaps this first blast of wintry weather caught you off guard. If so, now’s the time to prepare your vehicle and your garage for the winter ahead. During warmer months it’s common to park in the driveway to make room for bicycles and other sports equipment that tends to take over the garage. However, to maximize the life of your car and minimize your morning prep time, park your vehicle inside the garage whenever possible. Faced with a sea of bicycles, skateboards and soccer balls, it may seem impossible to safely squeeze your vehicle into the garage. However, it can be a lot easier than you think. First, sort through your things and edit anything you don’t need. Be brutal. That means ditching old tires, broken furniture and toys the kids have outgrown. If the item is still usable, donate it to a deserving charity or gift it to a friend. Rotate seasonal items. Group similar items. Find anything you need in a flash by storing related items into specific zones. Create an area near the garage door to store winter weather items, like salt and snow shovels. Set up a zone for automotive fluids and supplies. Store fluids on shelves or in a garage cabinet, away from kids and pets. Place winter sports gear in a dedicated zone children can easily access. Eliminate any unnecessary duplicates discovered while sorting. Arrange items along the garage perimeter. A wall organization system with movable shelves, baskets and hooks will maximize the items you can store along your garage perimeter. Once you’ve created space, park your vehicles inside the garage to protect them from the harsh winter weather. Now it’s time to prepare your vehicle for the heavy snow and bitter cold that lies ahead. The contradictory predictions about what to expect this winter require cautious drivers to prepare for whatever lies ahead. Take a few simple steps now to prepare your vehicle for frigid temperatures and snowy conditions. Stock up on automotive supplies like antifreeze, windshield washer fluid and wiper blades. Store additional supplies in your trunk, including all three items listed above. Keep kitty litter or gravel on hand to create traction if you get stuck and a shovel to dig yourself out. Get all-weather tires. Unlike all-season tires, all-weather tires carry the severe service emblem. An aggressive tread enables all-weather tires to bite snow and divert water and slush, so they handle better during perilous winter conditions. Another option is to get snow tires. Store the alternate set of tires on a tire rack to retain limited garage floor space. 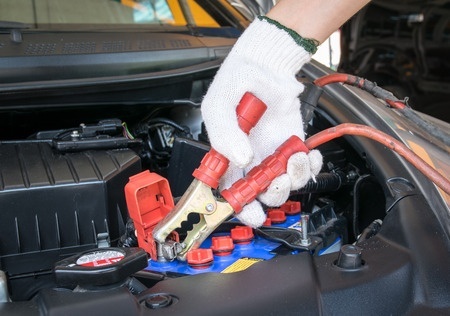 Keep vehicles running in top shape. Don’t skimp on oil changes and other maintenance. Thinner oil performs best during colder temperatures, but check your owner’s manual to see what the manufacturer suggests. Top off fluids, including windshield washer fluid and antifreeze. Keep the gas tank full. Don’t wait until your needle hits E. Fill your tank at the halfway mark so you’ll be ready if forced to sit in traffic for hours during a storm. Use an engine block heater when parking outside in brutally cold temperatures. By keeping the engine warm, the block heater prevents damage to engine components that can occur when heating the engine in extremely cold weather. Your car will also heat up faster. Whether we have a cold and snowy winter or a particularly mild one, there are sure to be plenty of days when winter weather will impact your commute. Prep your garage by reducing clutter, organizing the space and arranging items along the perimeter so you can park your vehicles inside. Ready your car for winter by stocking up on winter weather supplies. Store essentials in the trunk of your car. Invest in Ontario winter-worthy tires. 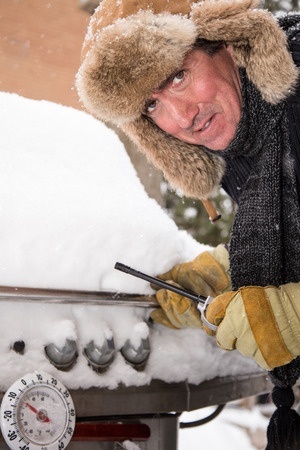 Properly maintain vehicles, top off fluids and use a block heater to avoid starting an ice cold engine. Then you’ll be prepared for the winter ahead, regardless of what the weather may bring.